April 12, 2016, 10:56 AM · In an effort to promote the coverage of live violin performance, Violinist.com each week presents links to reviews of notable concerts and recitals around the world. Benjamin Beilman performed in recital with pianist Andrew Tyson, replacing Christian Tetzlaff, who canceled for imminent arrival of his baby. Philadelphia Inquirer: "I'm not sure anyone locally knows the Ben Beilman we heard Friday night. Where the violinist was once merely polite, he has become beautifully refined. His sound has opened up. Ornaments to melodies have grown sophisticated. He has become an artist of firm ideas expressed with great polish." Benjamin Beilman. Photo by Giorgia Bertazzi. Jennifer Frautschi performed the Barber with the New Jersey Symphony. The Star-Ledger: "After a silvery tone in the first movement, the American soloist conjured a dazzling range of sounds, varying from sweet to downright astringent, from her 1722 Stradivarius." The New York Times: "In Barber’s Violin Concerto, with the sweet-toned but fiery violinist Jennifer Frautschi as soloist, there were voluptuous tuttis in which the orchestra’s string section flexed its might, part of a big-hearted and shapely performance that paid homage to the power of meticulously phrased, cleanly sung melody." Tai Murray performed the Barber with the Royal Liverpool Philharmonic Orchestra. Liverpool Echo: "Murray’s lustrous playing in the opening allegro was subtly framed by the Phil, while the andante second movement was sensitively and soulfully realised – so much so you could hear a pin drop in the hall....As for the presto finale? Murray made it look effortless, head up and eyes fixed somewhere ahead of her as her bow whipped across the strings, the orchestra pacing along beside her, and later joining the audience to applaud her back on to the stage." Igor Yuzefovich performed the Barber with the Singapore Symphony Orchestra. The Straits Times: "His exquisite sound, fluid bowing, impeccable phrasing and fine sense of direction made for a wonderfully complete solo performance." Tasmin Little, Ray Chen Rennosuke Fukuda, and Jianfeng Chen performed at the opening concert for the Menuhin Competition. The Guardian: "Tasmin Little brought lyrical sweetness to the rhapsodic solo line of Gustav Holst’s early, Max Bruch-like A Song of the Night, while Ray Chen launched into Brahms’s Violin Concerto with tremendous energy and intensity, even if it all became a bit too relentless before the end.... 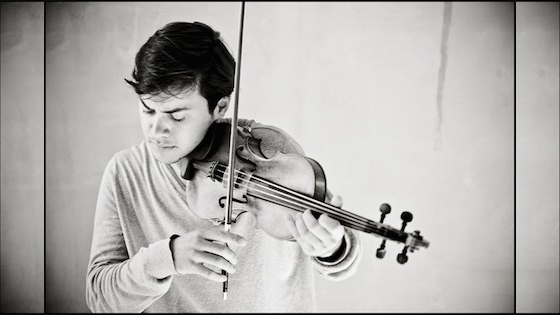 The winner of the junior competition two years ago, Rennosuke Fukuda, certainly dispatched Franz Waxman’s Carmen Fantasie with every bit of the brilliance it needs, while Jianfeng Chen got to give the world premiere of the solo-violin test piece commissioned for this year’s senior competition from Roxanna Panufnik." Viviane Hagner performed the Chin with the BBC Scottish Symphony Orchestra. The Guardian: "Viviane Hagner was the soloist in the fiendish and beautiful Violin Concerto written for her by Unsuk Chin, and she spun out its glassy, implacable lines with the kind of calm resolve and steely grace that only she could." Carolin Widmann performed the Berg with the Sydney Symphony Orchestra. The Sydney Morning Herald: "In the first half Carolin Widmann's? cogent and richly expressive performance of Berg's Violin Concerto was equally well shaped with musicianly refinement, even though Berg's elusive ideas can escape before their significance is grasped." Itzhak Perlman performed works by Stravinsky, Franck, Dvorák, and others, in recital with pianist Rohan de Silva. The Guardian: "Itzhak Perlman has had a five-star career, made five-star recordings and remains indelibly a five-star presence on the concert platform. This Barbican recital, nominally to mark Perlman’s 70th birthday last August, was a rare chance to pay homage to indisputably one of the great violinists. What it was not, though, was a five-star recital." Evening Standard: "He still has an enthusiastic following, as this sell-out recital amply demonstrated. And though the technique is inevitably no longer incomparable, he can still deliver." April 16, 2016 at 03:54 PM · . . . love all the above . . .